Education is not preparation for life; education is life itself! And there are many inspiring souls on this earth who are giving this life; one of them is Mr J. D. Khurana. 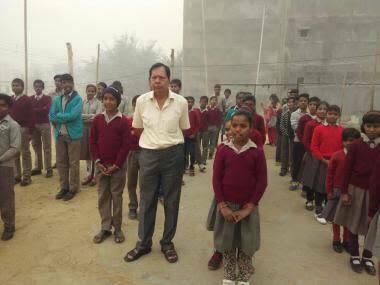 Mr. Khurana and his staff do not have roof or even a school building but he has an open gate for hundreds of poor, orphan kids who need a ‘life of education’. Mr. Khurana is a Sikh who religiously practices Dasvandh, where the community donates one-tenth of their earnings towards the common resources of the community. He experiences immense satisfaction by serving the community and helping the people in need. "I have been through the pain, which these kids go through"
He recalls his days of struggle when he was just 3 years old when he witnessed the horrifying experience of the partition. His parents had no money when they came to India which forced him to stay in one or the other tents during his childhood. While growing up he realized the importance of education and used to spent hours studying under street lights. Since then, he had a strong desire to help people in need. 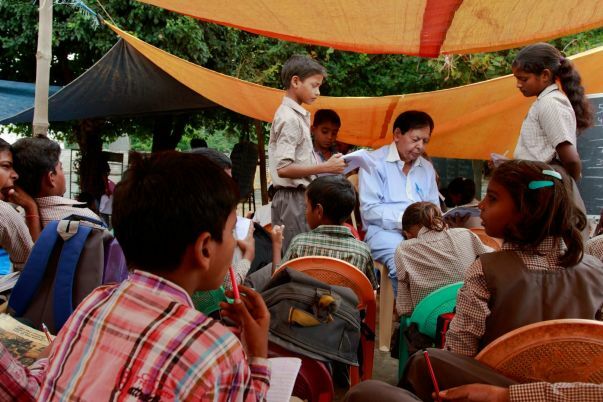 "Age is just a number, it is never too late for an act of kindness"
Khurana is a retired public servant from Haryana State Government and has been a ray of hope for parents, for whom providing school education to their kids was a distant dream. Nai Kiran School is a makeshift school though it may look like a temporary setup, however, in last six years, the school has positively affected lives of hundreds of kids by introducing them to the mainstream education absolutely free of cost. Apart from classes from nursery to 10th grade, the school also provides free stationery, textbooks, and uniforms. To ensure that none of the students have any nutritional deficiency, Khurana supervises a midday meal program. Nai Kiran is a one of kind initiative is supported by its own group of volunteers and well-wishers. "It all started with my driver's son"
Khurana recalls an instance from 1998 when he was posted in Faridabad. He was impressed by the inquisitive nature of his driver's son often visited the family home. The family began tutoring him every evening, and soon the child began to develop a keen interest in science. When the child showed promise, Khurana, enrolled him in private school and funded his education. Eventually, the kid grew to become an engineer and now works in a reputed organization. 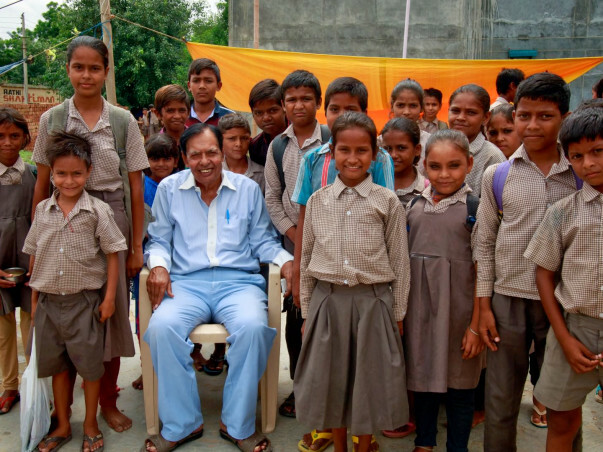 Khurana then decided that after his retirement he would start a school which would take care of such children. Khurana is a Sikh who religiously practices Dasvandh, where the community donates one-tenth of their earnings towards the common resources of the community. He experiences immense satisfaction by serving the community and helping the people in need. 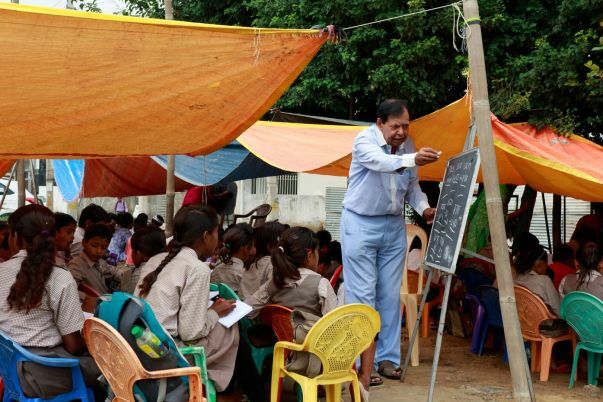 After returning to Gurgaon in 2005 post his retirement, Khurana with two kids from nearby slums started the school in a parking lot of his society. Inspired by his initiative of helping kids spend their time constructively, the other parents from nearby areas approached him. Gradually the number increased to 30 children and they needed a bigger place to conduct the classes. Khurana used an old plot he had invested in to conduct classes and the school was now conducted out in the open. 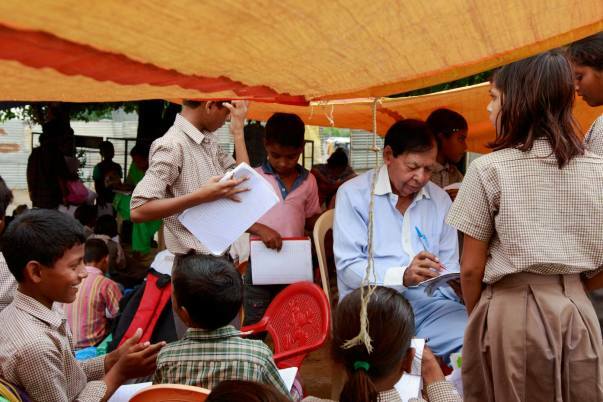 In order to ensure that the kids won't be distracted during the class, he set up tents with his own pension funds. 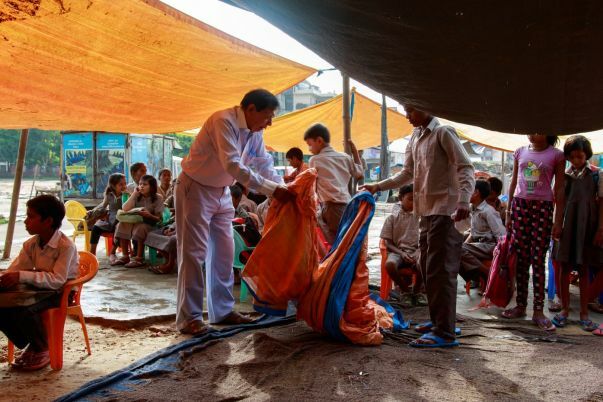 "For six years now, I have been waking up 5:30 AM to prepare for the classes"
Khurana's day starts at 5:30 AM with cleaning the plot, and arranging equipment for setting up the tent and ends at 10:00 PM when he finishes buying stationery and grocery for next day's midday meal. Nai Kiran School is run with the help of a paid staff of 14 teachers, four assistants, and one administrator. 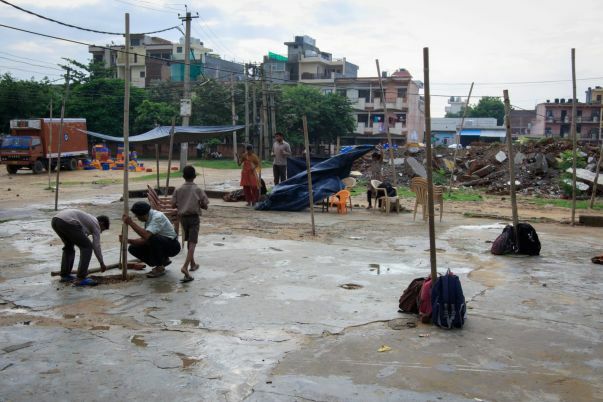 Eight volunteers also help with the smooth functioning of the school. The biggest challenge the school faces currently is the absence of an infrastructure. Every day, time and effort go into raising the tents. The children also get distracted easily because of the lack of secure rooms and need to be monitored constantly so they stay within the school premises. 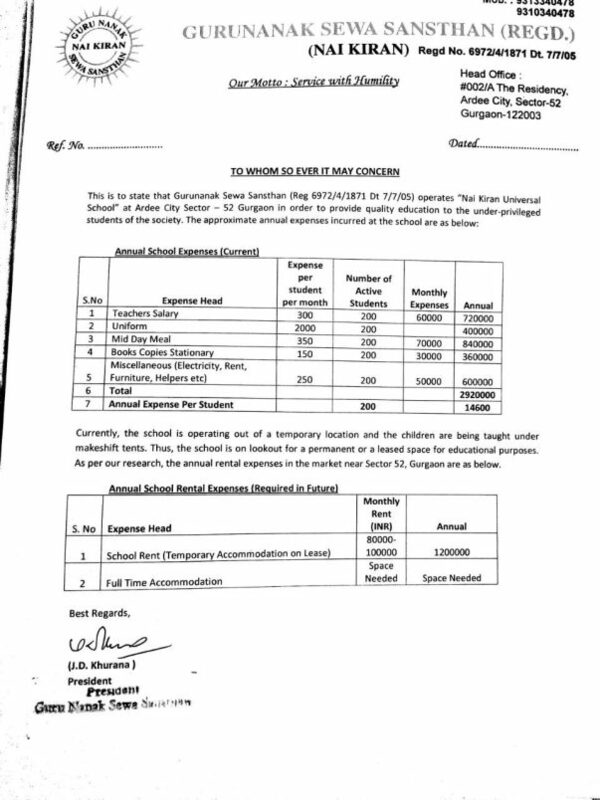 The school currently requires financial support in order to build a school building. Your support will help the children to get an education and build a great future for themselves, their family and the nation. 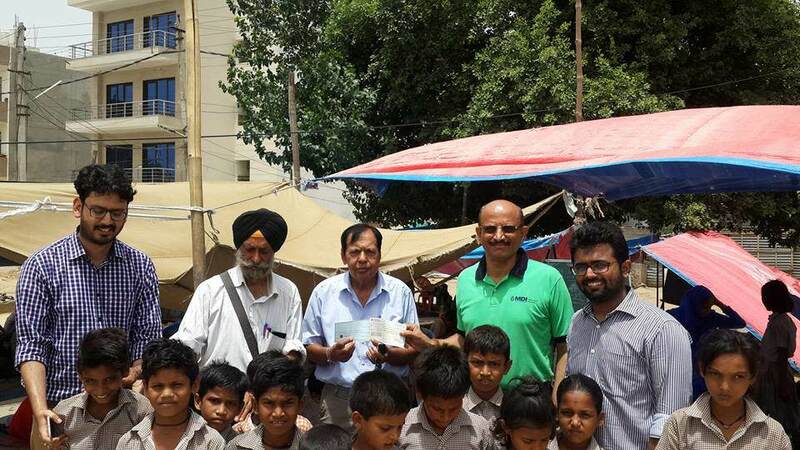 The funds collected will be used to build a roof, provide books, uniforms and a smile for poor students of NAI KIRAN UNIVERSAL SCHOOL, Gurgaon. With your help we hope to bring roof, school books and uniform to these kids. Team SARATHI , which consist of Students of Executive Post Graduate Program in Management (EPGPM), one year MBA, of Management Development Institute (MDI), Gurgaon have taken an initiative to be a part of this journey of Mr. Khurana through a fund raising drive. We, Saarthi, are very happy and humbled with all the help and blessings you have showered on these kids. With the funds raised, Nai Kiran Universal School Managed has build Book bank, bought new clothes and managed daily school operation. Kids have asked us to thank each one of you, teachers and Khurana uncle have given warm wishes and lots of blessings. Attaching pics of the handing over the donation money from Professor Atmanand (MDI college) and Saarthi Club members (Student of MDI). We are also delighted to share that this campaign has been selected among the top Education campaign on Milaap and likely to be selected for Education-live program from Indian Express in coming days. 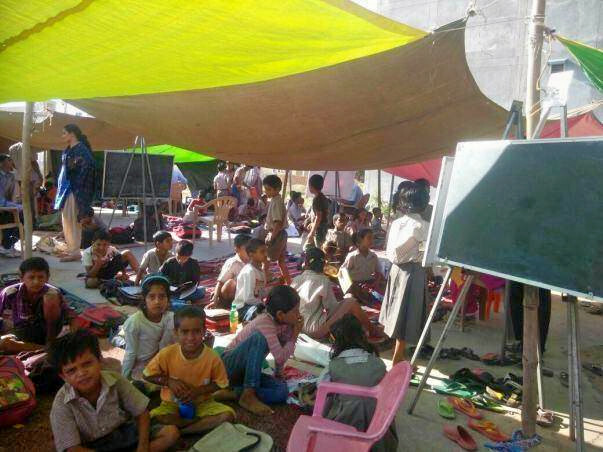 If you think you can help please come forward and help these kids to realize their education rights! We need to extend the campaign till 7th march as we are expecting good outcome from our last phase of campaigning and we want to end this campaign with a small felicitation function for Mr. J D Khurana and Milaap organization at our MDI campus. Please continue supporting the cause. We are overwhelmed with joy, seeing the kind of support you have given to this campaign. All thanks to all of you for supporting and sharing this cause. We hope you have a wonderful year ahead. 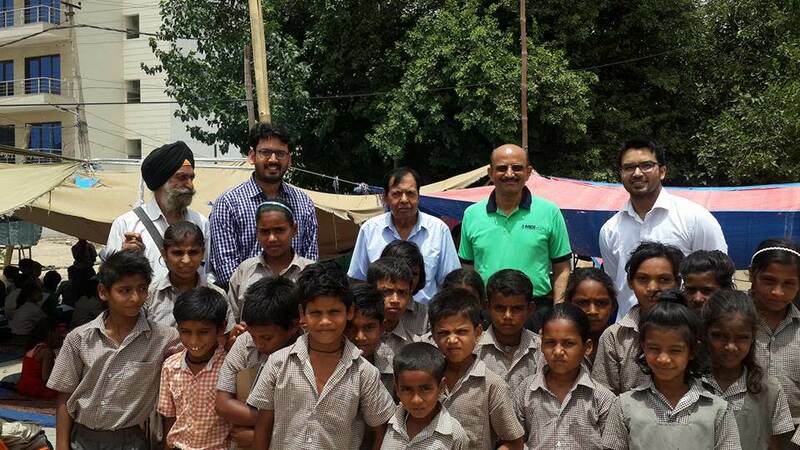 We request you to continue supporting the cause and helping Mr. Khurana touch lives of those lovely Kids.